Dr. Shanté Paradigm Smalls, Assistant Professor of English, co-edited the most recent of GLQ: A Journal of Gay & Lesbian Studies. “Queers Read This! 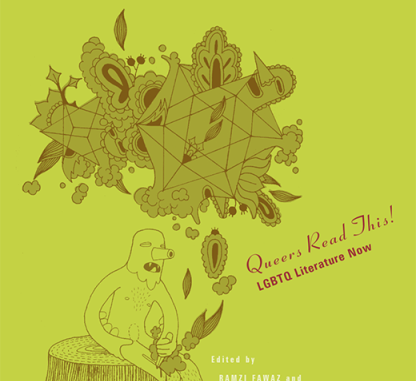 LGBTQ Literature Now,” edited by Ramzi Fawaz and Shanté Paradigm Smalls, is now available. This issue asks how LGBTQ literary production has evolved in response to the dramatic transformations in queer life that have taken place since the early 1990s. Taking inspiration from “QUEERS READ THIS!”—a leaflet distributed at the 1990 New York Pride March by activist group Queer Nation—the contributors to this issue theorize what such an impassioned command would look like today: in light of our current social and political realities, what should queers read now and how are they reading and writing texts? The contributors offer innovative and timely approaches to the place, function, and political possibilities of LGBTQ literature in the wake of AIDS, gay marriage, the rise of institutional queer theory, the ascendancy of transgender rights, the #BlackLivesMatter movement, and the 2016 election. The authors reconsider camp aesthetics in the Trump era, uncover long-ignored histories of lesbian literary labor, reconceptualize contemporary black queer literary responses to institutional violence and racism, and query the methods by which we might forge a queer-of-color literary canon. This issue frames LGBTQ literature as not only a growing list of texts but also a vast range of reading attitudes, affects, contexts, and archives that support queer ways of life. Browse the table of contents and read the introduction, freely available now.